It’s hard to believe that any real estate across the street from Disneyland would be left to develop, but this new hotel was recently built from the ground up – on three acres that had been an overflow parking lot. Opened in the summer of 2015, this is not a typical Courtyard property. It was custom designed for the family market, with several amenities that make it seem more like a full-service resort. It’s a hip space, with modern design elements blending with Spanish colonial architecture. There are wood beams, arches, colorful blue and yellow tile accents, and California beach artwork throughout. 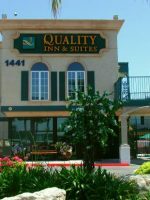 Also, this property should not be confused with the other Marriott Courtyard in Anaheim, closer to the convention center. 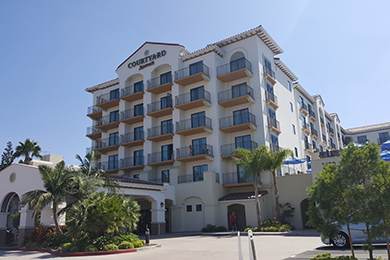 Besides being a brand new hotel, this Courtyard has three major attributes: location; an onsite water park just for guests; and spacious rooms. 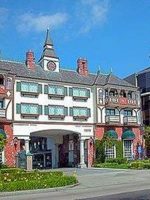 The location is ideal for getting to the two Disney theme parks on foot – the front door of the hotel is just a five-minute walk from the entrance of both. In fact, it’s closer than two of the official Disney hotel properties. You don’t really even need a car once you’re there, because the convenient ART shuttle bus service has a hub at the Disney entrance, and from there you can ride to several other Anaheim attractions, such as Knott’s Berry Farm. The property has its own Surfside Waterpark, with waterslides, a water play structure, and two pools. 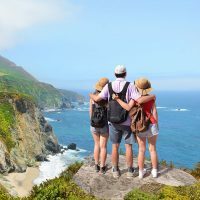 Families with up to six members can all stay together in the rooms here; every one of them has twin bunk beds, as well as a refrigerator, microwave, and free Wi-Fi. There are a total of 202 rooms in this six-floor property, including 19 suites. All rooms feature twin bunk beds, with a rail across the top bunk. There is a maximum of six people per room. Cribs are free to borrow (and available on a first-come, first-served basis). Rollaway beds are not available. Connecting/adjoining rooms are not available. You can request rooms next to each other, but these can't be guaranteed. The bathrooms are separated into two spaces, each with a shower (one has a bathtub). The separate vanity space with two sinks conveniently expedites getting a family of four or more ready faster. Complimentary Paul Mitchell toiletries are provided. 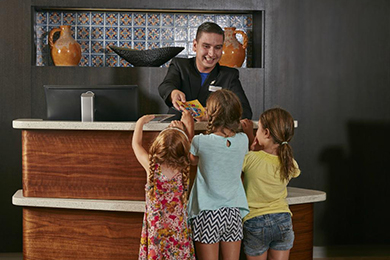 Along with free Wi-Fi access, each room has a 47-inch flat-screen LCD television with Netflix streaming capability, HBO, and kid-friendly networks like the Disney Channel, Cartoon Network, and Nickelodeon. All rooms have a hairdryer, iron and ironing board, coffeemaker, microwave and mini-refrigerator. NoÂ pets are allowed on property. 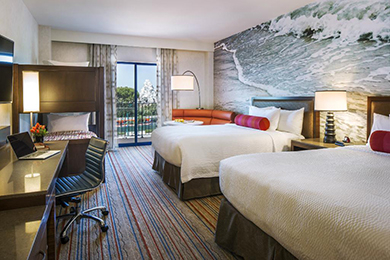 Rooms range from 400 to 840 square feet and most offer at least partial views of Disneyland - great for viewing the nightly fireworks. Full or shallow balconies are available in both standard rooms and suites. Standard family rooms range from 530 to 550 square feet. These either have one king bed or two queens, in addition to the bunk beds. There are 19 suites that range from 730 to 930 square feet. These either have one king bed or two queens, in addition to the bunk beds. These have separate dining and/or living room areas. This is our third stay at this property and we had a really great time. The room is well setup for families visiting the park. The entrance area has extra space for shoes car seats etc. the setup of the bathroom works well with families with kids, especially with two showers. The food options downstairs also worked well, not to mention the other options close by. The staff was great, especially the two staffers manning the pool area. They some how managed to memorize most of the kids names and and made our kids feel really special that someone took the time to connect with them. When we were leaving one of the staffers (I feel bad that I don’t remember her name) even came up to tell me what great kids we had which was a really nice way to end the trip. The property is getting a little older and you can start to tell somethings are wearing out, I’m hopeful the owners reinvest in the property to keep it in good shape as we would like to continue to stay here in the future. It’s taken us a while to find a hotel near Disneyland that works for our family. This is a newer property around the Disneyland parks. The girls love the bunkbeds and the diner style eating around next to the sofa. I chose this place mainly for its closeness to the entrance and being a newer hotel. We were pleasantly surprised by the big swimming pool area with lots of different features for the girls. We actually would come back to the hotel after lunch so the girls could swim and cool off a bit before going back to the park. Overall it was a very enjoyable experience. 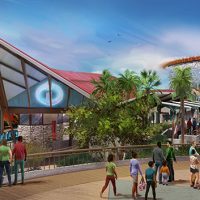 You simply must leave time in your day to enjoy the Surfside Waterpark, a colorful surfing-themed facility with plenty of cushioned lounge chairs and shaded seating where you can watch your kids play happily. 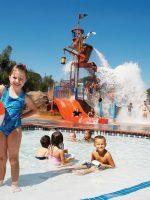 The main attractions are the two 30-foot waterslides (one open and one enclosed), and a water play structure with a 400-gallon drench bucket, fountains, bubblers, pull-cord faucets, troughs, spray guns, and other fun interactive elements. There are also two pools; the rectangular one is 3.6-feet deep, and the circular kiddie pool is one-foot deep. Only guests of this property can enjoy the water park, and you'll be issued waterproof wristbands to wear while you're there. There are two lifeguards, with one assigned to the top of the waterslides. Children must be 36 inches tall to ride the shorter slide, and 40 inches to ride the taller one. All children who aren't potty-trained must wear plastic swim pants, which are available for purchase in the gift shop. The water park hours are 10 a.m. until 10 p.m., and it's the most crowded in the late afternoon. Towels are provided. Within five minutes, you can walk to the entrance of the Disneyland Park and Disney California Adventure theme parks, as well as Downtown Disney. You'll also be able to see the nightly fireworks show from the property. This casual counter service eatery serves breakfast with Starbucks coffee products between 6:30 and 10 a.m. It's open again from 5 to 11 p.m., with light dinner options (soups, salads, sandwiches), beer, and wine. 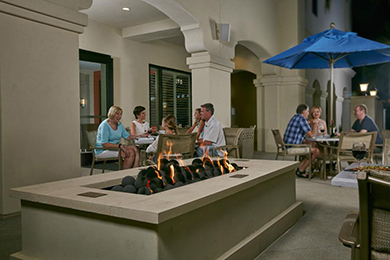 The adjoining outdoor space is called The Terrace, where you can sit near the fire pit in the evening. High chairs are available. The Bistro Kids menu is a bargain, particularly at breakfast with French toast, cereal, or scrambled eggs for only $4.50. Two chain restaurants share the front parking lot of the hotel: Panera Bread and Mimi's CafÃ©. Both have children's menus and high chairs. Panera Bread serves a health-conscious menu, and is open from 5:30 a.m. to 11 p.m., which is later than most locations. Mimi's CafÃ© features an American and French comfort food menu, including peanut butter and jelly or ham and cheese crÃªpes. It's open 7 a.m. to 11 p.m. 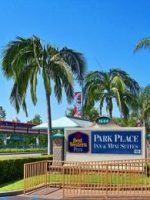 There are plenty of dining options within walking distance along South Harbor Boulevard, including Denny's, McDonald's, and a 24-hour IHOP. 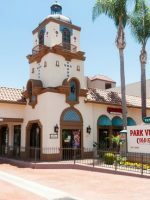 In less than a mile, you can walk to the Anaheim GardenWalk, a shopping and dining district with restaurants such as Roy's, Bubba Gump Shrimp Co., and The Cheesecake Factory. Check in is at 4 p.m., and check out is at 11 a.m. Guests may use the computers and printer in the lobby. There is also a large touch screen "GoBoard" that provides information on local attractions, dining, and transportation. There is no ATM on property, but there is one located at the Fairfield Inn hotel next door. There is a large gift shop in the lobby that sells Disney and California souvenirs, toys, limited clothing and personal accessories, snacks, and health and beauty aids. Behind the registration stands, there is a smaller food concession called The Market, where you can purchase shelf-stable food and frozen microwavable meals. The hotel doesn't provide babysitting services, but works with a local agency, Around the Clock Sitters. The sitters are background-checked and are all more than 30 years old. There is a desk in the lobby where you can purchase tickets for Disneyland Park or Disney California Adventure. The most economical tickets are multi-day passes for three or more days, which include a "Magic Morning" early admission on one of the days. The 1,100-foot, state-of-the-art LIFE FITNESSÂ® Center offers free weights, Flexstriders, and a variety of other equipment. It's open to guests 24 hours a day. Parking is by valet only, and the fee is $20 plus tax daily, per car. 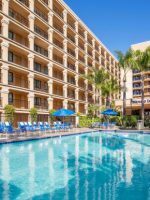 The summer months (June through August) are the most popular times to stay at the hotel, as well as holiday periods when Disneyland runs special programming. You'll find the best rates in January and February. Discounts are available for military, seniors, and AAA/CAA members. Marriott vacation packages are available that combine this property with car rental and airfare. 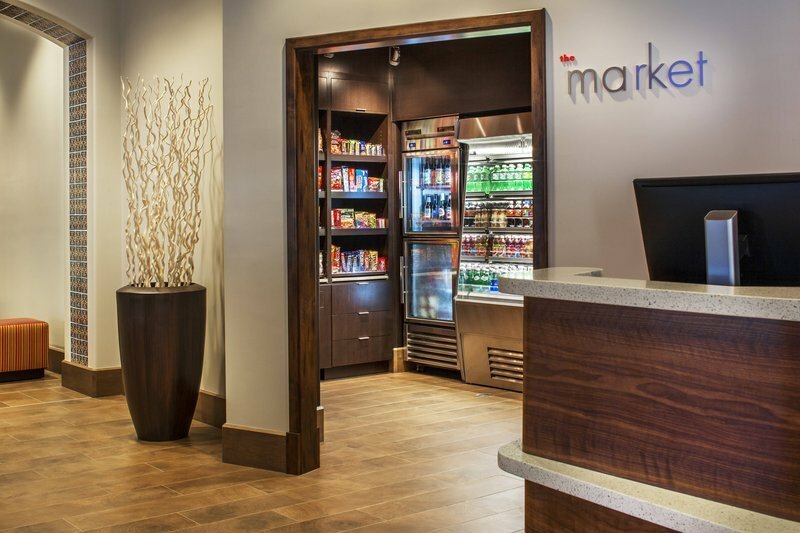 Marriott points can be accrued and spent here. If you're driving, you'll take Interstate 5, the Santa Ana Freeway. There are three nearby airports: the John Wayne/Orange County Airport is 14 miles away. The Long Beach Airport is 19 miles away. Depending on traffic, LAX is less than an hour away (35 miles), and it is served by more airlines than the others. The hotel does not provide airport shuttle service, but recommends Karmel Shuttle service to all three airports. Amtrak serves Anaheim. In fact, you can take the Pacific Surfliner from Anaheim directly to the San Clemente Pier on the beach. The train station, called ARTIC (Anaheim Regional Transportation Intermodal Center), is about 3 miles away. If you don't have a car, or haven't rented one, you can still get around Anaheim very easily. The ART (Anaheim Resort Transportation) bus system has about 15 numbered and color-coded routes that travel through different sections of the city. There's a hub at Disneyland's main gates. Buses are in service seven days a week, typically between 7 a.m. through midnight. You can purchase one-way fares or day passes, and use the mobile app to track the arrival time of the next bus. Taxi service is readily available in Anaheim, as is the Uber ride share service. A night out on the town without kids might begin on the property, where you could order beer or wine from The Bistro and take it to the outside seating area with a fire pit to watch the Disneyland fireworks. 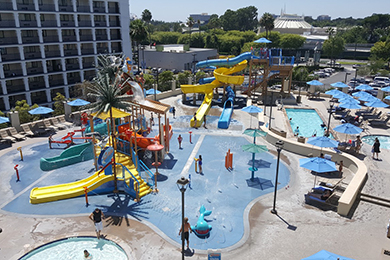 You could also eat out or catch live music at Downtown Disney, at the Anaheim GardenWalk, or in the Anaheim Packing District, accessible via the ART bus system.